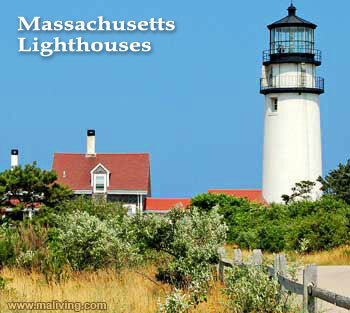 Come discover the history behind the Southern Massachusetts lighthouses, which are placed on some of the most beautiful settings – near beaches, on rock bluffs, or just surrounded by beautiful ocean views. Plymouth Harbor, where the Mayflower once landed, is full of history and lighthouses. Some Massachusetts lighthouses are not open to the public. Ask us about visiting Massachusetts or share comments. To feature your MA business, contact us. Cohasset: on Cohasset Rocks outside Boston Harbor the lighthouse was built in 1860. This 114 feet tall granite tower is best seen by boat. Scituate: This 50 tall tower is located in Scituate Harbor. Built in 1811 the tower was made from granite and brick. The grounds and lighthouse are open year round. Plymouth: built in 1843 the lighthouse is located in Plymouth Bay. Standing at 34 feet tall and made out of wood the tower is still in operation. Plymouth: located on the main channel to Plymouth Harbor this ligthhouse is 47 feet tall and made from cast iron. Made in 1871 the lighthouse is best seen by boat.